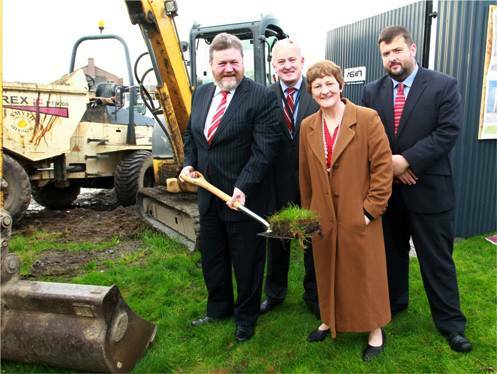 The Minister for Health, Dr James Reilly, T.D., today (Monday 21st November, 2011) turned the sod on the new Adult Acute Psychiatric Inpatient Facility to be built on the Beaumont Hospital campus in Dublin. The new unit is being developed by the HSE in co-operation with Beaumont Hospital and on completion will be managed by HSE North Dublin Mental Health Services. It will include inpatient accommodation to replace services historically provided in St. Ita's Hospital, Portrane and will serve a population of approximately 250,000 people in the North Dublin area. Minister Reilly turns the sod on the new Acute Psychiatric Unit at Beaumont Hospital (l to r) Minister for Health Dr James Reilly T.D., Liam Duffy CEO Beaumont Hospital; Dr Mary Cosgrave, Executive Clinical Director, HSE North Dublin Mental Health Services, Stephen Mulvany Regional Director of Operations HSE Dublin North East. The total cost, including enabling and ancillary works, will be €13m and construction is scheduled for completion by the second quarter of 2013. Funding for the unit has been provided under the HSE's Capital Plan for the development of psychiatric services nationally. The unit will be a significant development in the provision of Acute In-patient Mental Health Services for the clients of North Dublin. The purpose built accommodation will meet the long-term needs of this client group. It will be built to the highest possible standards and will meet both HIQA and Mental Health Commission requirements. The new unit will provide consultant led, multidisciplinary acute in-patient mental health care in an open setting for adults and the elderly. It will enhance the development of specialist psychiatric outpatient care by linking it to the outpatient facilities which are already available for other specialties within Beaumont. The HSE acknowledges the ongoing patience of service users, their carers and families, and the flexibility of staff during the necessary moves preceding the opening of the unit in 2013.